Cadillac's STS is nearly the same size as the CTS, but the STS is aimed at a different class of vehicles. STS's aspirations of becoming a world-class vehicle are backed up by a healthy list of electronics such as 5.1 surrround sound, DVD navigation, active cruise control and stability control. 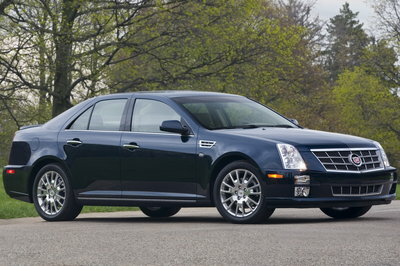 The base STS is offered with a either a V6 or Northstar V8 coupled to a 6-speed automatic. The STS-V performance model features a supercharged 4.4L Northstar rated at 469 hp. Standard V6 and V8 models are offered in RWD and AWD configurations. Starting in the 40s, the STS can get pricey with some V8 models topping $60k. The STS-V performance model has been dropped. Two new exterior colors.